Holds the majority of flat screens up to 37" weighing less than 80 lbs. Black powder coated steel construction for a lasting and sleek display. (4) 4" Swivel caster wheels for a mobile cart with two locking wheels to keep in place while in use. Extendable side shelf for holding laptops or other presentation equipment. Locking security cabinet to store AV equipment or other items while not in use. Comes with UL listed/CSA approved 15' cord, 4 outlet power strip with surge protector, and a cord winder to instantly plug in AV equipment. 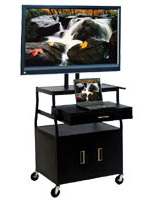 This rolling AV cart that holds the majority of flat screens up to 37" makes a great classroom presentation stand. 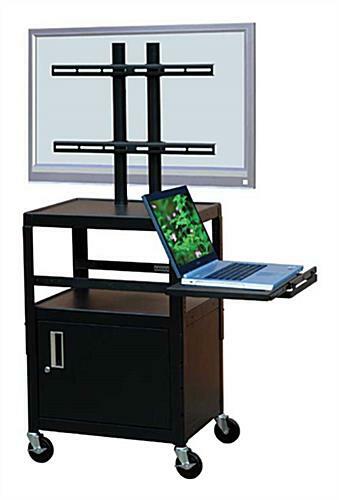 Purchasers can utilize this stand for giving presentations or just for showing educational movies. This mobile audio visual trolley, rolling AV cart that is equipped with a security cabinet allows users to keep expensive equipment locked up. Instead of strapping a bulky television to the top of a trolley, users can mount plasma monitors on this versatile mobile furniture. 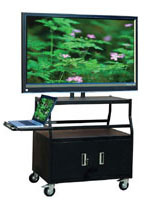 This steel rolling AV cart is durable and can withstand continuous use in an educational establishment or an office. The Black powder coated finish creates a sleek display that will suit nearly any environment. This rolling AV cart that includes 4" swivel caster wheels is easy to move around a room or even throughout a building. This display also comes with a UL listed 15' powder cord with a 4 outlet surge protector and cord winder so purchasers just need to supply the audio visual equipment! 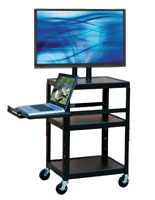 This rolling AV cart provides ample storage space which can often be a challenge in cramped areas such as a classroom. 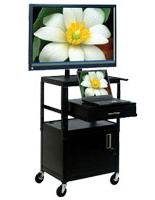 This mobile trolley is one of many sizes and styles audio visual available here. This rolling AV cart is made in the USA and provides a quality fixture for businesses. This unit is height adjustable. This rolling AV cart, also known as audio visual storage furniture, has an extending side shelf to place a laptop while presenting. The top shelf is variable in height and can go from 26"h to 42"h in 4" increments. This rolling AV cart ships unassembled to save on shipping costs! This audio visual furniture can hold a laptop, dvd player, in addition to the flat screen! This display has a 24"w x 18"d shelf for notes or other items. The security cabinet is the ideal place for a dvd player and other items while not in use. Manufacturer model #FPCAB4226E. 23.5" x 15.5" x 17.5"